Read a sample chapter: Characteristics of Acids and Bases: How Can the Chemical Properties of an Aqueous Solution Be Used to Identify It as an Acid or a Base? This resource is set apart from other lab manuals by its unique approach to scientific inquiry. Rather than guiding students through one set of steps, traditionally taught as the scientific method, students are first introduced to a task and the tools they might use. ... We will be using more labs from this resource next year. I would recommend this book for secondary as well as undergraduate chemistry teachers with inquiry teaching experience. I was impressed by its thoroughness and teacher–friendly design. 5 Gold standard for scientific inquiry. Argument Driven Inquiry in Chemistry goes above and beyond the typical inquiry lesson in ways that dramatically elevate student interest and engagement and that teach the process of scientific discovery better than any other strategy that I have utilized. When students view the results of an experiment as a claim that they must defend, ownership of the experiment undergoes a complete metamorphosis. 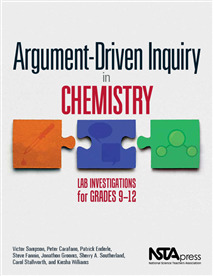 The authors create ways for chemistry students at all levels to experience the entire process of scientific research in easy-to-execute investigations that pose the challenge of determining an answer to a guiding question, presenting an experimentally determined answer as an argument supported by evidence, justifying the evidence as relevant and supported by background knowledge, presenting the argument, evidence, and justification in a poster presentation, and submitting a written report for peer review and revision before final presentation as a completed product. It is, from question to presentation, the authentic collegiate research experience happening at the high school level in the high school laboratory. The term “game-changer” is a gross understatement. This is the most dramatic paradigm upheaval and the most exciting innovation in my entire career as a chemistry facilitator, and I could not recommend it more highly as a reference for well-developed investigations, a method for shifting existing lab investigations, and a springboard for writing original inquiry experiences in this format.